OWFI Conference . . . I’m There! Okay, it’s been way, way too long since I’ve been to a writing conference. (I’m in Norman at the Oklahoma Writers Federation Conference.) I’m having SO! MUCH! FUN!!! I feel like a dog who can’t wag her tail fast enough. “Oh!” pant “Hi!” Wagging tail. “It’s so nice to meet you!” Pant, pant. Tail wagging faster. “This is so cool! Isn’t it?” Panting as fast as tail is wagging. “Don’t you love this?” Pant, wag, pant, wag. “Isn’t this the best speaker/breakfast/group/whatever?! ?” Passes out from hyperventilation and tail exhaustion. I know you won’t believe this, but sometimes I don’t get to talk. (Yeah, they lucked out.) Writers love to tell stories, so they kind of pile up on each other. I have a whole scorpion story I didn’t get to tell last night. Funny how much there is to learn at one of these places. And how many people there are to meet. How about you? Do you enjoy going to conferences? Three little letters but a great big word–a constant in a writer’s life. Plotting. Scene and sequence. Make up stories. WHY does your character do what s/he does? WHY does this or that happen just when it should/shouldn’t? WHY does this turning point take place as/when it does? WHY are you writing this particular story? But the most import thing, the WHY I’ve heard since the very first conference I attended . . .
Don’t get me wrong. This isn’t a ploy to whittle down my competition. 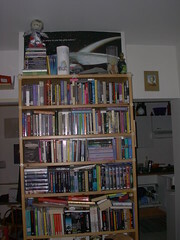 I’m convinced that if I write a book that’s good enough, a publisher will make a place for it. I just think it’s a wise woman who knows what she does and WHY she does it. And a wiser woman who knows when it’s time to stop doing what she doesn’t enjoy or finds something she likes more. So . . . WHY do you write? Here are a few of the answers I’ve heard. To turn the world into the place you want it to be. So how about it? Writers . . . ? I talked my man into going to an arts and crafts fair this weekend. It’s a huge show with way more stuff to see than I can take in. I love it! The first thing that caught my eye was the woman’s booth. It wasn’t just a table or a couple of shelves. It was an elaborate set of antique shelves and crates and what looked like it might have been part of an old post office at one time. But what made me come back at the end of the day was the merchandise. These sweet babies. Now, I’ve never been a doll lover. Didn’t like them when I was little, don’t care a lot for them now, because most of them are just lifeless blanks. Think about Barbie. Or even Raggedy Ann. They’re all the exact same. To be honest, these aren’t all that different. I saw very similar dolls in a couple of other booths at the fair as I looked around. But those left me cold. Why? I wondered. What was it about this woman’s dolls that made me have to go back? So this morning when I couldn’t sleep, I got to wondering why. It was more than just being handmade. It wasn’t just the antiques used to display them. And it wasn’t that each doll had something extra with it. Finally, I got it. In her booth, every doll had a story to tell. 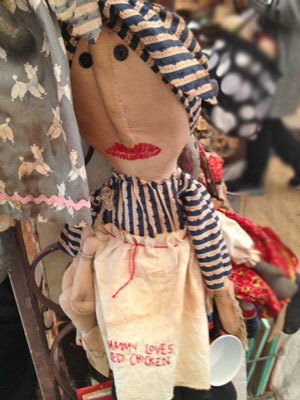 One of the mammy dolls had a pair of antique scissors around her neck, hanging on an old piece of twine. The mama doll in the picture above has, “Mammy loves fried chicken” embroidered on her apron and an old cup in her hand. One of my favorites was “keeper of broken dolls” angel. She had a Betsy-Wetsy doll in her arms. And the B-W doll was obviously broken. This is the queen of the flamingos. 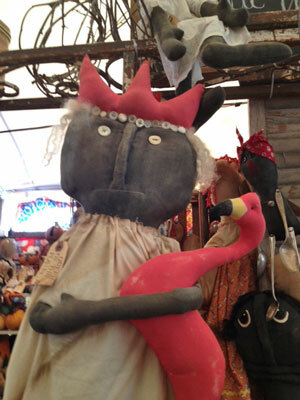 Besides holding a darling flamingo, she has old buttons edging her crown. Of all the dolls and pretties in the show, I had to have one of these dolls. (I really wanted to buy several, but I restrained myself.) The woman who makes these dolls goes the extra mile. Each doll has a story, and I have to think of it as “heart”. What’s that have to do with writing? In the same way there are lots of dolls looking for a home in the world, there are millions of writers trying to sell. When an editor is looking for a new book to publish, how will she choose? If I were an editor, I’d look for a manuscript with heart. It’s easy with dolls, right? Just add an antique or embroider her skirt or give the doll a doll. But how do you give a story heart? I’m not an editor, but I am a reader who won’t finish a boring book so in a sense, I am an editor. I’ll tell you what I’ve learned from reading great authors. The way to give your story heart is to go the extra mile. Make your settings real. Find out what the place smells like in the morning. What your characters hear when they can’t sleep in the night. What does the light look like when the sun goes down before it gets dark. And how dark does it really get? Make your characters real. Vulnerable. Imperfect. Give them scars and warts. 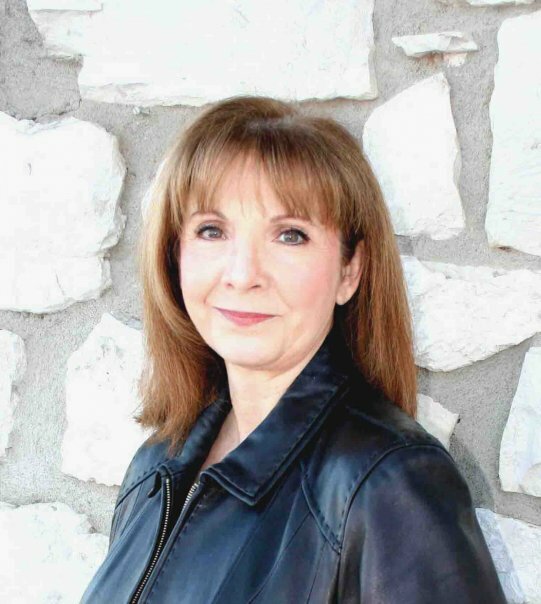 I’m rereading one of Marilyn Pappano’s books right now. Just a few moments ago, I (when I read, I’m the POV character.) wrapped my hands around a steaming cup of chai tea. I closed my eyes and enjoyed breathing in the cinnamon and clove scented steam wafting off of it, and finally took a long sip. As KT mentioned, we’re away this weekend. And, as she thought, we’re having crazy fun. This is a fantastic group of women. We’re not all the same religion. What we have in common is that we’re all writers. Romance writers. (IMO the best kind is the HEA kind.) We love a great story. And very few of us can tell you our names in less than a page-and-a-half. Last night, we had a delicious meal and came back to the suite to just chat, and ended up talking about our writing histories. Roughly half of us are published. Some of us have confessed for money. The one thing these women have in common, besides being writers? about telling a great story. about learning whenever and whatever they can. From the woman just beginning to our master, Rita winner (80 books and counting) we’re a lift each other up, cheer each other on, lend a hand when we can and cry with you if we can’t crew. And just to be very honest, we never retreat. From what I’ve observed in life, a person who really wants to do something will find the time to do it with all her heart. Take my dad, for instance. He loves being a geologist and, at eighty-one years old, still has a great time at his work. He comes to the office nearly every day (if he’s not out in the field) goes to trade shows, keeps up on the latest technologies and takes work home with him because that’s what he loves. How abut writers who deep down really love to write? They not only get those stories down (No duhs out there, you guys. You’d be shocked at how many people join writing groups who don’t write.) they belong to groups, go to conferences and retreats, enter contests, Nanowrimo, critique, volunteer to help others, study and grow their craft. Yesterday I met a writer, trying to sell her books at a function I’d been given a ticket to. One book had a purple cover, and the other was gray and had a paranormal-type picture on the front. Feeling sorry for her (just a tad) I invited her to visit RWI. Her words made me thrilled to be a member of RWI. One of the rules of membershp is to volunteer for a duty. Some only perform that one duty, but several volunteer to do several things. Those who volunteer to do several things are often the ones who come to meetings, make it to our retreats, go to conferences, take online classes, join functions such as this blog, Nanowrimo and final in contests. In my experience, writers who love to write, who want to grow their craft, keep on learning and selling and learning, do more. As Miss Marilyn has said more than once, we all have the same twenty-four hours in a day to do what we please. How we choose to use those hours is up to us. So what do you think? Should a writer keep her bottom in her chair and write, write, write or is there more to being a successful author than sitting at a computer?